Before I start, maybe I should say that this isn't the most amazing cake I've ever eaten. True, I did love it for the sum of its parts, for the deliberate act of assembling its components, for its subtle mix of simple flavors. But I think it's possible to love a cake purely for the process of making a cake. That is how I love this cake. I love this cake with all of my old soul. Last year I found a copy of Debora Madison's Seasonal Fruit Desserts at the library. It may no longer be in print, but I loved it so much I found a used copy online, and I'm so glad I did. It's become a manual I consult whenever I have extra fruit on hand, and it's consistent in the new inspiration and techniques it teaches me. 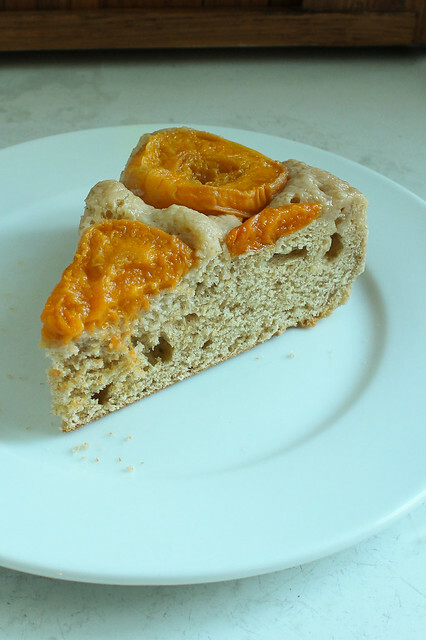 Ripe apricots in hand, I began my search online for what to make with them when I remembered she had a recipe for a yeasted pear cake, baked in a cast iron skillet upside down style. Obsessed as I've been with mint lately, I was really looking for a way to combine some perfectly ripe apricots with fresh mint... and preferably in some type of cake since it has been awhile since I've made a cake. Fortunately, I decided on this old-fashioned skillet cake. I was happy for a few occasions to share it, since it is a good sized cake and not really a "good keeper", although I have been appreciating it gracefully staling cold from the fridge and with a scoop of vanilla ice cream. I can't complain. With only 6 tablespoons of sugar, this is a decidedly unsweet confection. The apricots turn soft and jamlike and make this the perfect thing to have with coffee or tea (or with the aforementioned ice cream, the ice cream adds a little extra sweetness and helps the dry crumb go down a little easier). I played around with the spices a little and think I could have maybe been a little more aggressive, but in a way it works because the apricots are the stars of the show. Make sure you take note of each part of the process, enjoying the steps as you go. It's not a one-bowl cake; it requires some finesse, especially when working with a soft and somewhat sticky dough. The texture of the cake is akin to a biscuit, and as Madison says, it is best warm. I would store any leftovers in the refrigerator and try to eat them within a few days. The texture changes, but it's still good. I used Lonesome Stone Milling's organic all purpose flour which is wheatier than most, more like a "white wheat" available in the regular grocery. The recipe is written for a 10 inch cast iron skillet (oddly enough, that's my number 8 skillet), you could use a well buttered 10 inch springform or cake pan and brown the fruit with the butter in a skillet first if you don't have cast iron that size. Melt 3 T. of the butter in the cast iron skillet over medium-high heat. 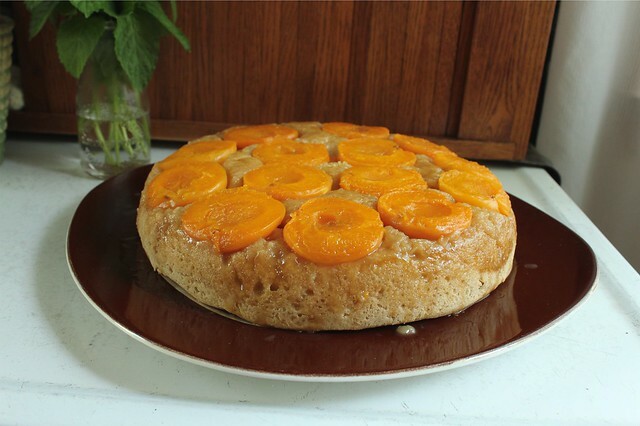 After it melts, brush it well up the sides of the pan and add the dark brown sugar and the apricot halves. 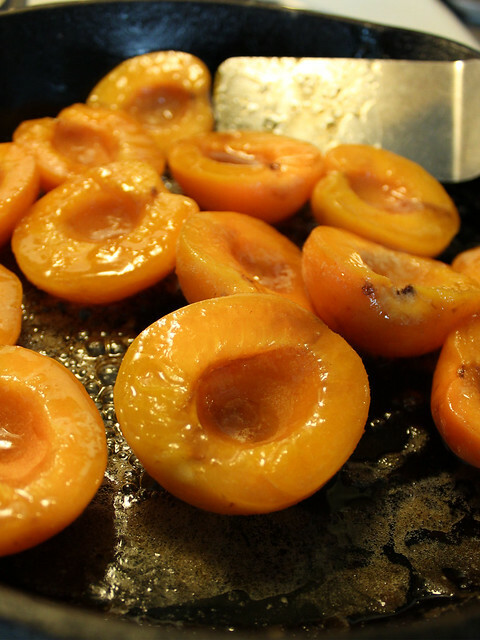 Toss the apricots in the bubbling mixture to coat, and then let them brown slightly on both sides, about 4 minutes total. Turn them all cut side down and arrange them as you like and remove the skillet from the heat. Put the warm water and milk in a small measuring cup and add the yeast and 1 t. of the sugar from the measured 1/4 c. of granulated sugar. Set aside to proof, and meanwhile whisk together 2 c. of the ap flour with the cinnamon and cardamom. 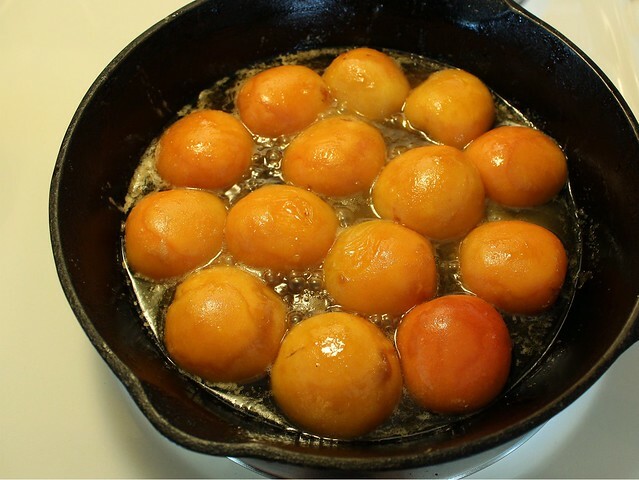 In a bowl of a stand mixer (or in a large bowl if working with a hand mixer), add the egg and egg yolks, almond extract, remaining sugar, and salt. Working with the paddle attachment, beat in the yeast mixture on low speed, then add the flour/spice mixture (also at low speed) 1/2 c. at a time until it is all incorporated. Increase the speed to medium-high, and add the soft butter. Beat for 2-3 minutes until the batter is smooth and glossy. By hand, stir in the remaining 1/2 c. flour, and turn it out onto a lightly floured counter. (It will still be sticky, use a bench scraper to help you maneuver it.) 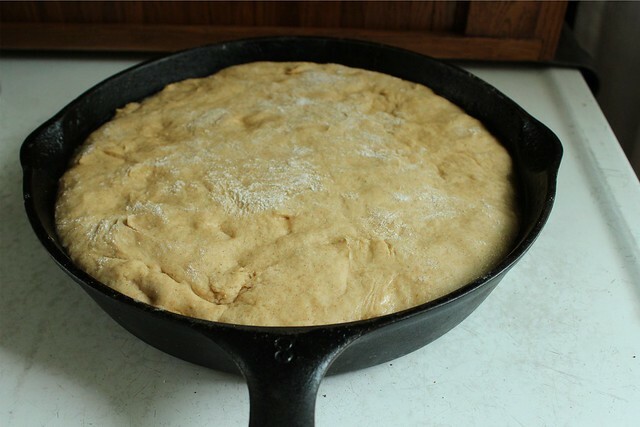 Knead it gently a few times, then pat into circle the same size as the skillet holding the apricots. Lay the disc over the fruit, and slide the whole pan into a plastic bag to rise for 30-40 minutes. Preheat the oven to 350. Once the oven is hot and the cake is noticeably risen, remove it from the plastic bag and bake until golden brown and a tester comes out clean, about 30 minutes. After removing from the oven, immediately invert by placing a cake plate over the pan and flipping it carefully. As Madison recommends, serve it warm with whipped cream (she also recommends sabayon) - I say go for the vanilla ice cream. Of all the many cakes I've made over the years, not many yeasted cakes come to mind (a noteable exception is the panettone), and this one seems to be versatile enough that with mindful spicing, you could use just about any fruit that comes to mind. I'd imagine using a whiter flour would result in a slightly less dense cake, but I like this old-timey texture and depression-era sweetness. It's satisfying. This slice is 3 days old, and I took the picture tonight just as the sun was about to fall behind the trees. It's not photogenic really, but it shows the texture of the cold cake pretty well. I always think there are two types of people (well, 3 really if you count "pie" people) those who refrigerate cakes and those who don't. I am one who doesn't. I don't like cold cake, I like cake about to fall apart under the weigh of my fork - or better, under the weight of thinking about my fork. But this is a sturdy cake that I love and I hope you'll love it too. If you happen to try it with other seasonal fruits, let me know will you?